First day of actually teaching my theories on cinematic animation. So excited to have a platform to address concerns I feel the college can improve upon, within the animation department. I'm ECSTATIC to have an fantastic team of ten students willing to put their faith, artistry, and trust into my vision. 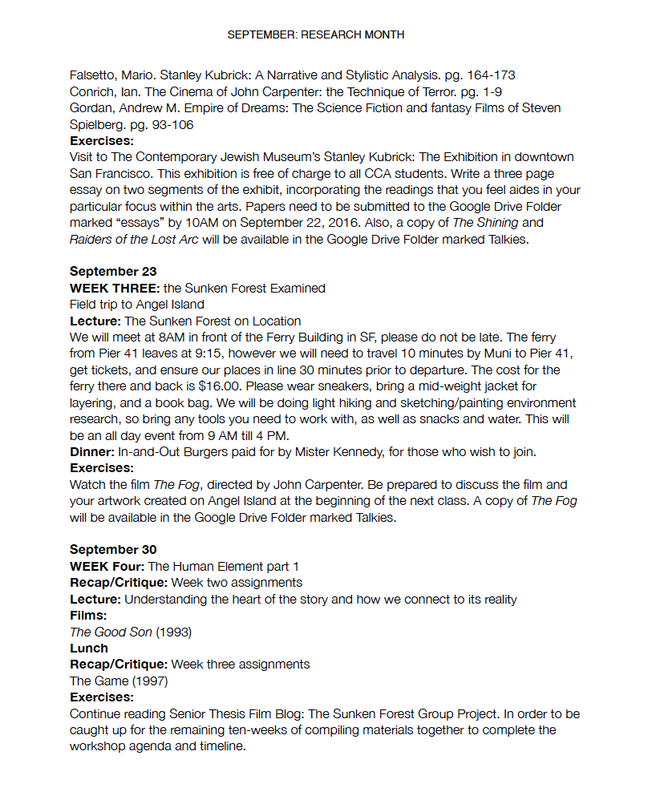 Here's a recap on the student guide "syllabus" I've crafted for the course and what it means. I wrote the student guide over the summer well before I received the actual syllabus on Friday from GE. 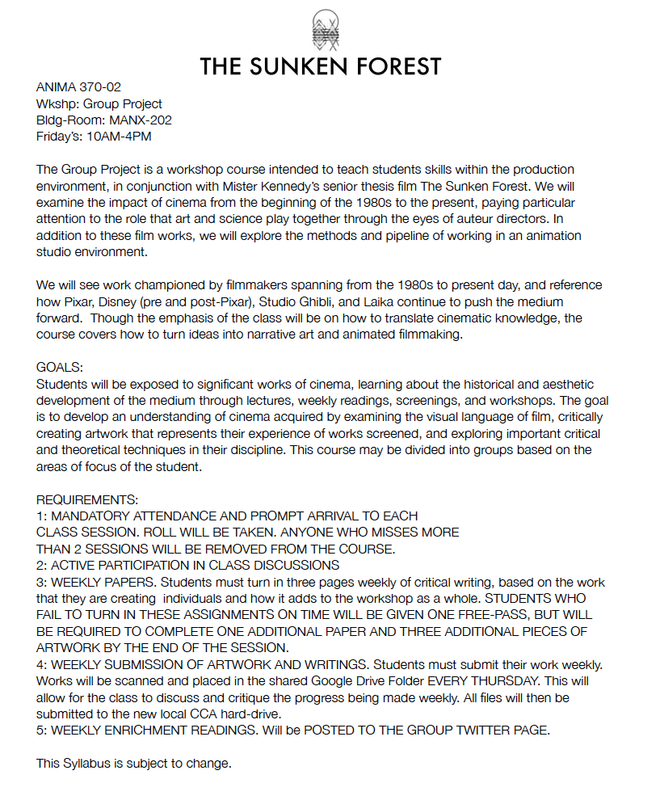 Surprisingly the curriculum I've laid out matches that of the animation workshop description, that I presented to the class on Friday. The first three weeks of the guide are to lay out what I find inspiring, through my research over the summer. I've discovered that you can’t be invested in a project that you can’t relate to. Last week was about understanding your roles within the project, a way to help you figure out what is expected within the production of a short film. Which is why I screened the films I did, starting with the overlaying theme of creating a movie that reaches every viewer. I related this theory by screening The Essence of Humanity. As well as planned on showing The Making of The Incredibles. This coming week is the subject matter of the short, most of the students don’t understand the elements of a horror/thriller/ action drama. I’m working on a blog post today that will feature methods of translating my story into visuals that match what I am looking to achieve. This will allow for students to begin some exploration work based on the blurb of the story posted the group blog back in June entitled Plotted. The following week upon your approval is geared towards understanding the environment in which the story takes place, hence the field trip to Angel Island, to sketch and visit places that I drew from on the island. An idea I took from the document that I saw on the making of UP: Adventure Is Out There. Personally, I feel it would be unfair to ask the class to begin working on my film if they don’t understand my references, or what my taste is. Hence creating a outline of week by week engagement on the research, that I’ve done in support of this course and how I would like it to apply to the film. This guide is only for the month of September which I’ve deemed a necessity for research, while still allowing for ten weeks (60 hours x 10 students= 600 student hours) of working time to flesh out and assemble the short. I would also like to focus on the art of social networking in professional settings such as LinkedIn. I also have begun reaching out to local animation groups to participate in guest lectures, that will help to enrich not only our team but the departments as a whole. Also, in preparation to better understand the subject matter in which we will be interpreting into the workshop film, I suggest everyone visit the resourceful website PBS has created in support of Ken Burns' The Dust Bowl.